The music of the African American tradition is rich in history and culture. For hundreds of years, the sounds of the African American spiritual and music of Black composers have shaped classical music in ways we often neglect to acknowledge. 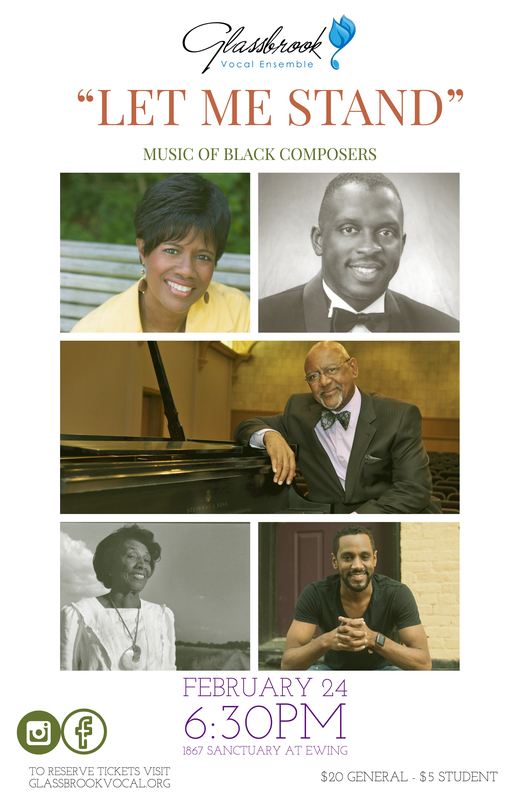 Join Glassbrook Vocal Ensemble in the beautiful space of the 1867 Sanctuary, as we honor and celebrate the diverse compositions of Black composers, past and present with music by Carter, Powell, Moore, Hailstork, and more. Glassbrook Vocal Ensemble is a professional choir based in Ewing, NJ seeking to enrich the lives of those in diverse communities by supplying the highest caliber of choral music-making. Glassbrook presents captivating concert experiences through collaboration with local musicians, arts organizations, and venues. The choir balances traditional choral music with premieres of new compositions to create varied programs for modern audiences.